WordPress does not have a system for speed optimization by default. That’s why you need a powerful plugin that speed up WordPress with technical and advanced features, yet accessible to everyone. WP Speed of Light starts with a cache and Gzip compression system, plus, a resource minification and group, a database cleanup system, a CDN integration, an htaccess optimization and auto cache cleaner. When it comes to performance loading time, it require some test to identify which plugin, theme, page may require more attention. WP Speed of Light includes a speed loading test and compare, and a database query speed test. 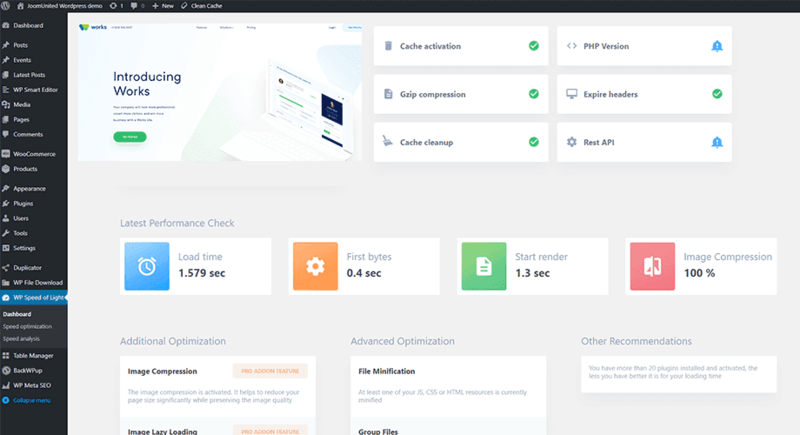 WP Speed of light for WordPress is coming with a lot of optimization system: Cache system, Gzip data compression, browser caching, resources minification. WP Speed of light generates more static content (HTML) therefore reducing the number of database queries. Plus, you have the possibility to store the major part of the heavy page resources (like images) in the browser cache. And you can clean it when you want! The database queries can represent something important regarding the WordPress speed. The database speed test may help you to determine a problem with a theme or a plugin and maybe fix some major performance issues. The database cleanup can be made automatically at a defined frequency in WP Speed of Light PRO ADDON. A cache cleaning system is available to automatically clean it at a regular interval and a button to run a custom clean from everywhere (every admin and public pages). Plus, you have setting to exclude admin user from cache and to exclude some specific pages. Depending of the font sizes and variation, fonts can be one the heaviest resource to load. With WP Speed of Light PRO ADDON you have the possibility to group all the font and to load them as a single file. 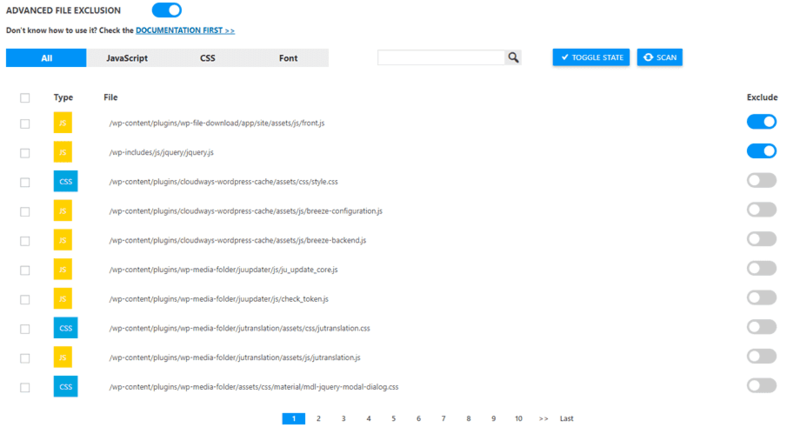 The file group and minification is one the tricky stuff to configure on complex WordPress website with tons of plugins. 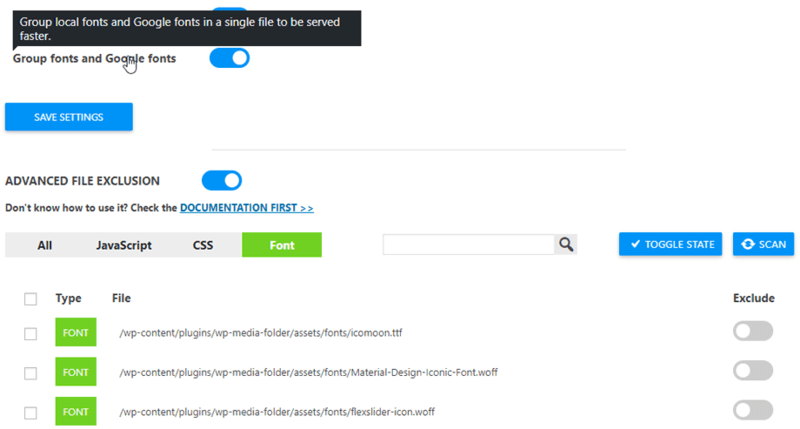 We’ve made the process simple: scan your website and index the files then, if needed, exclude one or several files from the process by using a simple ON/OFF button. If you’re a multiple site owner or web agency that need to run optimization on all your client websites, use our Export/Import tool to replicate plugin configuration in no time. WP Speed of Light addon offer the possibility to defer script loading in page footer, remove the render blocking heavy resources to be loaded in your page header, in a click! The cache pre-loading is the process of generating a first version of the page cache automatically, so the first user that comes to the page after a cache cleanup won’t have to wait for the cache generation! It’s included in the plugin PRO ADDON. The DNS prefetching will pre-load DNS information on external domain links. For example, if your website is referring frequently to an external domain in hyperlinks, pre-fetching the DNS of this domain will load the page of this domain faster when a user click on it. It’s included in the plugin PRO ADDON. WP Speed of Light is, by default, fully compatible with WooCommerce. Don’t worry about cart refresh, payment problems… All your shop pages will be displayed fast and properly, no advanced configuration needed. A dashboard is available to check all major performance issues you have and fix it in one click, pretty handy to optimize performance in no time. If the cache have been served using SpeedCache extension got a green symbol on your below your chrome extension logo, if not it’s grey, as simple as that! JoomUnited chrome extension cache checker displays also general information (apply to all websites).